Each offseason, MiLB.com goes position by position for every farm system and honors the players -- regardless of age or prospect status -- who had the best seasons in their organization. The result is our Organization All-Star series, which is now in the books for 2018. This edition of Toolshed caps the 30-part series with its picks for the top performers at each position across every system. To qualify, a player must have been named an Organization All-Star for his farm system. In short, this is the best of the best from Minor League Baseball in 2018. Catcher -- Danny Jansen, Buffalo (88 games), Toronto (31 games): Coming off a breakout 2017 in which he climbed three levels, the Blue Jays' No. 3 prospect solidified his place as one of the game's best-hitting catching prospects, and he was justly rewarded with a Major League debut in August. The 23-year-old backstop posted a .390 OBP, .863 OPS and 146 wRC+ during his time with Triple-A Buffalo -- the top marks for Minor League catchers with at least 300 plate appearances in 2018. His 12 homers in the International League represented a career high, two more than he hit in 2017 in 16 fewer games. He continued to show laudable plate discipline, with 44 walks and 49 strikeouts in his 360 plate appearances at the Minors' top level. Jansen's profile remains bat-first, though he was an above-average framer in the Majors. The 2013 16th-rounder has earned his spot as Toronto's expected Opening Day catcher, moving ahead of veteran backstop Russell Martin. Honorable mention: Joey Bart made an incredible first impression by hitting .298/.369/.613 with 13 homers in 45 games with Class A Short Season Salem-Keizer after going No. 2 overall to the Giants in June. Austin Allen's 22 homers for Double-A San Antonio were most by a Minor League catcher, and he backed those up with a 130 wRC+. Ronaldo Hernandez hit .284/.339/.494 with 21 homers for Class A Bowling Green and also threw out 36 percent of attempted basestealers. Video: Danny Jansen hits a homer in the third. First baseman -- Peter Alonso, Binghamton (65 games), Las Vegas (67 games): The Mets' No. 2 prospect may have captured the Joe Bauman Home Run Award on his last swing of the year, but it was his season-long breakout that landed him here. Yes, Alonso tied for the Minor League lead with 36 homers and led the Minors with 119 RBIs, but he was also among the full-season Minor League leaders in total bases (277, third), extra-base hits (68, third), slugging (.579, fifth) OPS (.975, ninth) and walks (76, 14th). With a 180 wRC+ at Double-A and 139 wRC+ at Triple-A, Alonso dominated both levels he saw in 2018 and would have pushed for a Major League cameo had the Mets been at all close to contention down the stretch. He'll bring big right-handed pop to Queens this spring. Honorable mention: One of the closer calls in this category was omitting Nathaniel Lowe after the Rays' No. 13 prospect hit .330/.416/.568 with 27 homers in 130 games at Class A Advanced Charlotte, Double-A Montgomery and Triple-A Durham. A drop in production at that final stop kept him from jumping past Alonso, but the 2016 13th-rounder certainly put himself on the map and has a Futures Game appearance to show for it. Second baseman -- Jeff McNeil, Binghamton (57 games), Las Vegas (31 games), New York (63 games): At times in 2018, the Rumble Ponies and 51s had the best offensive right side of the infield across Minor League Baseball. McNeil led full-season second baseman in the slash-line categories, hitting .342/.411/.617 at the upper levels. The left-handed slugger's 176 wRC+ was not only 10 points higher than the closest competition at the position -- Brandon Lowe had a 166 mark -- it was fourth-best among all Minor Leaguers. McNeil collected 50 extra-base hits while striking out 42 times in 384 Minor League plate appearances, making him one of six of the 759 qualified full-season Minor Leaguers who had more extra-base knocks than whiffs. McNeil carried that hot bat to the Majors in late July and hit .329/.381/.471 in 63 games there. While that earns him no extra points here, it does emphasize just how real his 2018 offensive breakout was. 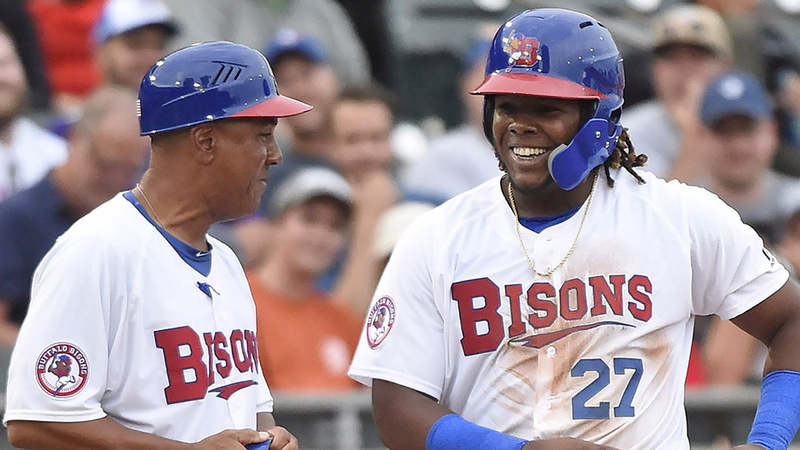 Third baseman -- Vladimir Guerrero Jr., GCL Blue Jays (three games), Dunedin (one game), New Hampshire (61 games), Buffalo (30 games): The easiest selection on here. The game's top overall prospect enjoyed a Minor League season for the ages, one that saw him still hitting .400 as late as Aug. 12. His final .381 average was 32 points above the next qualified full-season Minor Leaguer, and he also nearly lapped the field as the leader in slugging percentage (.636), OPS (1.073) and wRC+ (194). To put that into context, a wRC+ above 194 has only been posted in the Majors five times since 2000. Four of them were by Barry Bonds. The other was by Bryce Harper, in 2015. Guerrero clubbed 20 homers in 92 games and posted a nearly even 38/37 K/BB ratio. When he arrives in Toronto in 2019, he could become one of the game's best hitters immediately. As far as 2018 is concerned, he was undeniably the Minors' best hitter. Honorable mention: Taylor Ward hit .349/.446/.531 with 14 homers and 18 steals at Double-A and Triple-A. Josh Fuentes was the Pacific Coast League MVP. Bobby Dalbec clubbed 32 homers and finished with a .919 OPS. Play a sad song for those who had to play the same position as Guerrero this season. Shortstop -- Wander Franco, Princeton (61 games): There's only one Minor Leaguer on this list who played exclusively for a Class A Short Season or Rookie-level affiliate in 2018, and for good reason. With a limited schedule, that player would have to really dominate the lower levels to stand out compared to a large field of Minor Leaguers who played a full season at his position. Well, Franco really, really dominated the Appalachian League. At 17 years old, the Rays' top prospect was the circuit's MVP after hitting .351/.418/.587 with 11 homers, seven triples and 10 doubles in 61 games. His 159 wRC+ and 1.004 OPS were each tops among Minor League shortstops with at least 250 plate appearances, as was his rate of 1.42 walks per strikeout. The switch-hitter's .236 isolated slugging percentage ranked third among the 84 players in that group, ahead of more celebrated sluggers like Fernando Tatis Jr. (.221) and Carter Kieboom (.164). All of that happened in his first professional season, stateside or otherwise, as Tampa Bay got aggressive with the player it signed out of the Dominican Republic for $3.825 million in July 2017. Honorable mention: Kevin Smith hit .302/.358/.528 with 25 homers and 29 steals at Class A Lansing and Class A Advanced Dunedin, making him one of two 25-25 Minor Leaguers this season. Gavin Lux led full-season Minor League shortstops with a 147 wRC+ after hitting .324/.399/.514 with 15 homers. Jazz Chisholm hit 25 homers between Class A Kane County and Class A Advanced Visalia, six more than the next closest shortstop (Tatis). Alex Kirilloff, Cedar Rapids (65 games), Fort Myers (65 games): Kirilloff entered 2018 as a bit of an unknown, coming off a Tommy John surgery that robbed him of his first full season. He finished it anything but. The Twins' No. 2 prospect led the Minors with 71 extra-base hits -- 20 homers, seven triples and 44 doubles -- and 296 total bases in his 130-game run. His 172 wRC+ ranked second among qualified Minor League full-season outfielders, behind only Michael Reed's 178, which came in 157 fewer plate appearances. His .348 average was tops among the same group while his .578 slugging percentage came in second. It's worth noting that his spray chart was also a thing of beauty. Kirilloff showed one of the best combos of hit and power tools in the Minors this season, and it should be fun to see what he can do another year removed from major surgery. Kyle Tucker, Fresno (100 games), Houston (28 games): Tucker's .590 slugging percentage beat out Kirilloff's for highest among full-season outfielders. The Astros' top prospect slugged 24 homers and 54 extra-base hits over 100 games in the Pacific Coast League, also pacing full-season outfielders with a .989 OPS. Beyond his power, he showed a good hit tool and enough plate to discipline to post a .332 average and a .400 OBP. He also stole 20 bases, making him one of six members of the 20-20 club in the Minors in 2018. A lack of consistency in the Majors and the recent addition of Michael Brantley might complicate Tucker's situation in Houston, but there's no doubt he's earned an extended Major League look somewhere next season. Eloy Jimenez, Birmingham (53 games), Charlotte (55 games): Jimenez was already one of the Minors' top hitters after he produced a .317/.368/.556 line with 10 homers at Double-A Birmingham into late June, and then he was promoted to Triple-A Charlotte, where he hit .355/.399/.597 with 12 blasts. By the end of the season, he ranked third among Minor League full-season outfielders with a .577 slugging percentage and 168 wRC+ while batting .337 over his two stops. The White Sox are chasing big fish in the free agency department, and a big reason is that a lineup that featured Jimenez, Jose Abreu and Manny Machado and/or Bryce Harper would be feared across baseball. MLB.com's No. 3 overall prospect brings that much thunder to the table. Honorable mention: Casey Golden may have played in an offense-friendly environment at Class A Asheville, but his combination of 34 home runs and 24 stolen bases are mention-worthy. Myles Straw led the Minors with 70 thefts (in 79 attempts) between Double-A Corpus Christi and Triple-A Fresno. It helped that he had a .381 on-base percentage and 78 walks in 131 games. Designated hitter -- Jabari Blash, Salt Lake (83 games), Los Angeles (24 games): If a Minor League team needed somebody to capital-H Hit in 2018 (and Vlad Jr. wasn't around), there was no better option than Blash. The 29-year-old outfielder's .700 slugging percentage and 1.131 OPS led Minor Leaguers who accrued at least 300 plate appearances. With 29 homers in 83 games with Salt Lake, he would have easily challenged Alonso and Ibandel Isabel for the Minors lead if he hadn't been called up to the Majors five times before the Minor League season was out. Yes, that production had to do with Blash's time at Smith's Ballpark, where he slugged .839 and hit 19 homers in 42 games, but even his .285/.405/.563 line on the road was mighty impressive. He was the definition of a Quad-A player -- he went 4-for-39 with 24 strikeouts in the Majors -- but his Minor League dominance has earned him a $1.06 million contract with the Rakuten Golden Eagles in Japan for next year. Right-handed starter -- Chris Paddack, Lake Elsinore (10 games), San Antonio (seven games): This shouldn't be a surprise since Paddack won the MiLBY for Top Starting Pitcher in October, but it's worth reviewing just how dominant the Padres' No. 5 prospect was this season. He struck out 120 batters and walked eight over 90 innings between Class A Advanced Lake Elsinore and Double-A San Antonio. Among Minor Leaguers with at least 75 innings pitched, that rate of 15 strikeouts per walk was the best. His strikeout rate of 35.3 percent placed fourth while his 2.4 percent walk rate was third-best. He was second in FIP (2.01) and 20th in ERA (2.10). With an above-average fastball and plus-plus changeup, Paddack kept California and Texas League hitters off-balance all summer, and he made that package play up by pitching consistently in the strike zone. He also did all of that after missing the entire 2017 season due to Tommy John surgery. With those health concerns in the past, no Minor League right-handed starter was as consistently dominant across the board as Paddack. Honorable mention: Dylan Cease posted a 2.40 ERA and 1.06 WHIP while striking out 160 in 124 innings. Josh James led qualified Minor Leaguers with a 36.3 percent K rate by punching out 171 in 114 1/3 innings at Triple-A Fresno. Michael King ranked second among full-season hurlers with a 1.79 ERA and did so in 161 1/3 innings, fifth-most by a Minor League pitcher in 2018. Denyi Reyes finished with a 1.97 ERA and ranked second in the Minors with a 0.91 WHIP, thanks to his stellar control (19 walks in 155 2/3 innings). Left-handed starter -- David Parkinson, Lakewood (17 games), Clearwater (five games): The Phillies' No. 19 prospect vaults into this spot for one big reason -- his ability to limit opposing runs. Parkinson's 1.45 ERA over 124 1/3 innings was the lowest among Minor League full-season pitchers this season and the fourth-lowest since 2005 behind Justin Verlander's 1.29 in 2005, Jon Duplantier's 1.39 in 2017 and Blake Snell's 1.41 in 2015. His other numbers were pretty spiffy, too -- 28.7 percent strikeout rate, 1.01 WHIP, 2.64 FIP. Philadelphia didn't exactly get aggressive with the 2017 12th-rounder out of Ole Miss, but that can't be held against him in Organization All-Stars considerations. Parkinson kept opponent after opponent at bay in his two stops in the lower levels. Honorable mention: Jesus Luzardo became one of the game's best pitching prospects during his first full season post-Tommy John surgery and finished with a 2.88 ERA, 1.09 WHIP and 129 strikeouts in 109 1/3 innings while climbing from Class A Advanced Stockton to Triple-A Nashville. Patrick Sandoval split time between the Astros and Angels systems, posting a 2.06 ERA and 0.96 WHIP with 145 strikeouts and 29 walks in 122 1/3 frames across three levels. Zac Lowther's numbers (2.18 ERA, 0.98 WHIP, 151 strikeouts, 35 walks in 123 2/3 innings) were nearly similar at Class A Delmarva and Class A Advanced Frederick. Reliever -- Colin Poche, Jackson (nine games), Montgomery (three games), Durham (28 games): The 24-year-old left-hander struck out 23 batters and allowed five baserunners to reach in 11 innings at Double-A Jackson before the D-backs sent him to the Rays in May. After another scoreless spell at Montgomery, he turned into the International League's most dominant reliever, posting a 1.08 ERA and 0.92 WHIP with 78 strikeouts and 17 walks in 50 innings with Durham. His combined 45.6 percent strikeout rate led all Minor Leaguers with at least 60 innings pitched. His 1.26 FIP was lowest among all Minor League relievers while his 0.82 ERA placed second. On top of all that, Tampa Bay's No. 24 prospect, who pitches with an above-average fastball and slider, was tough against both righties (.138 average-against) and lefties (.173 average-against). Poche was the prototype of what a dominant Minor League relief pitcher can be.